Knowlton Gallery has become known as the premiere Art Gallery in Knowlton and Lac Brome for offering some of the best local artists and exclusive artists from around the world who enjoy showing their art in the prestigious gallery in central Knowlton. Once again the Knowlton Gallery will be offering original and unique art and take the pleasure of presenting the Artist on site! A special presentation of the African Artist named Tunde Odunlade will take place this week-end in Lac Brome. Tunde Odunlade, artist from Africa, will be showing his own creations amongst those of dozens of other rarely displayed artists. The Knowlton Gallery has always been known for innovative displays and an expanding repertoire of artists and artworks but this is truly a unique event. Tunde Odunlade is one of the leading figures in the resurgence of traditional African art that came out of Oshogbo in the late 60s. 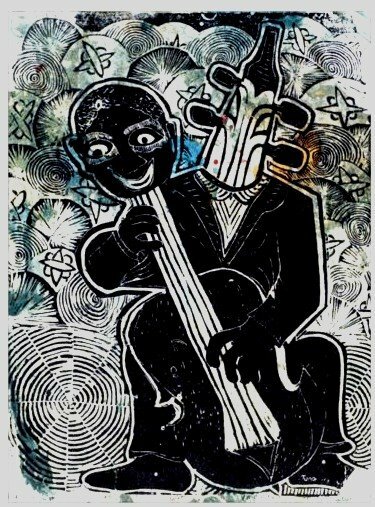 A second-generation artist from Ibadan, like many of his peers he is more than just a painter, but works also with hand-made paper, print-making, batik and fibre work - besides being an accomplished musician on the flute, Agidigbo (Mbira) and Congas. A freelance artist who spends time both in Nigeria and the United States he also manages his own music and dance troupe and has several record albums to his name. 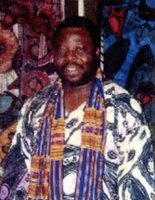 He has mastered the intricate art of batik, a craft that developed from the tradition, for which the Yoruba were famous, of adire cloth dyeing. Not only will Tunde Odunlade be presenting his latest creations he will also be showing and helping to showcase the art of other African Artists who wish to present their works here in Knowlton. Many North American residents have not heard of Tunde Oduunlade, who is an internationally acclaimed print and textile artist who has exhibited, taught, lectured, studied and travelled extensively within Nigeria and throughout the USA and Europe. The art of Tunde Odunlade has been displayed in many solo shows around the world. His works are in the private art collections of such clients as the World Bank Headquarters of Washington, DC. The Victoria and Alber Museum in London, The MacArthur Foundation and The State House in Lagos, Nigeria as well as in the private collections in North America, Europe and Nigeria. Come see the beautiful side of Nigerian Art instead of just associating the African Country with the 419's! Knowlton is again highlighting an International artist and you are encouraged to visit the Gallery in downtown Knowlton on Sunday to meet with the artist. Thanks to Francoise Desjardins for her efforts in bringing in such artists to The Eastern Townships. Information by telephone: 450-242-1666.